Thanks to the efforts of Eothan Alapatt and Now Again records there has been a revival of interest in Lee Anthony’s gallant Little Rock, AR True Soul records. And not before time. The reissue CDs have concentrated on the funk tracks and as that was the mean focus of the company that is only fair. But the ballad sides that were cut shouldn’t be overlooked. 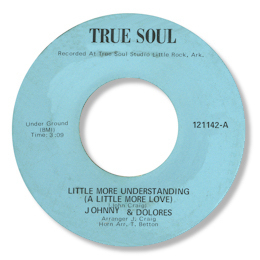 Classic tracks from the likes of the great Larry Davis and Chick Willis will feature in these pages but the starting point should be this release by Johnny & Delores – not least as it was the first True Soul 45. Little More Understanding is a tasteful vocal duet set in a fine southern setting, underpinned by impressive organ playing, strong horn blasts and some lovely guitar licks, probably by John Craig. 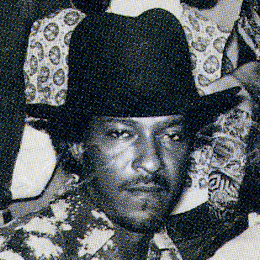 Craig is the “Johnny” part of the duo here, but spent more time as a guitarist, leading True Soul’s house band Pure Love in the 70s as well as making a few 45s under his own name. He helped in the studio too on the engineering side – a talented guy. I’ve no idea who Delores is sadly. UPDATE ~ My great friend Greg Burgess writes to say that Delores was Johnny's wife at the time the True Soul 45 was cut. He also points out that John Craig has his own website which you can find here. Always grateful to Greg for his wonderful detective work. Note ~ Neither of these sides are yet to be made available on CD but that shouldn’t stop you buying both volumes of Now Again’s True Soul CDs. They do contain a couple of John Craig’s solo work.